Sen. John Kerry gets mixed favorability ratings from the American public as the Senate Foreign Relations Committee takes up his nomination today to be the nation’s next secretary of state. Kerry is viewed favorably by 39% of the public, while a comparable number (36%) view him unfavorably. About a quarter offer no opinion (26%). Partisans hold sharply differing views of the 2004 Democratic presidential nominee. While a majority of Democrats (55%) have a favorable impression of Kerry and just 19% say they have an unfavorable view, Republicans see him more negatively: 52% have an unfavorable opinion of Kerry and just 28% have a favorable impression. Independents are divided in their assessments (35% favorable, 39% unfavorable). Just 35% of the public offers an opinion of former Sen. Chuck Hagel, President Obama’s choice to be the next secretary of defense. 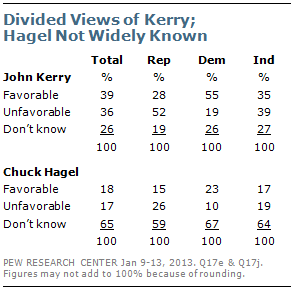 Those that do rate Hagel are about equally likely to view him favorably (18%) as unfavorably (17%). By about two-to-one (23% vs. 10%), Democrats view Hagel favorably. Among Republicans, the balance of opinion is negative (26% unfavorable, 15% favorable). Hagel receives mixed ratings from independents (17% favorable, 19% unfavorable).